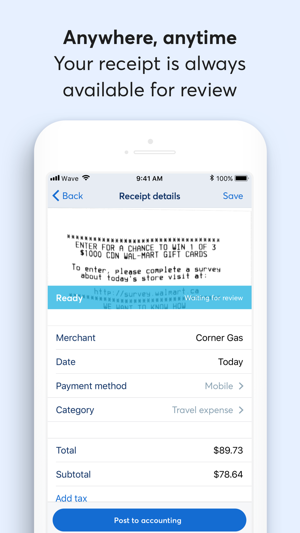 Say goodbye to that wallet, purse, or shoebox full of receipts with this companion app that syncs with your online Wave account for free. 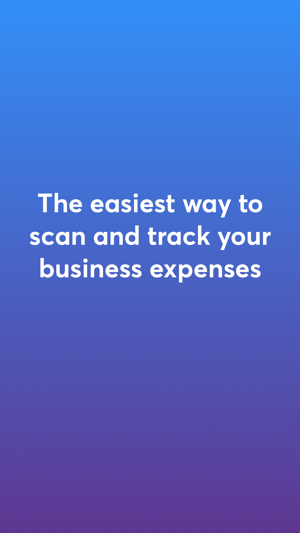 Expense tracking has never been easier for the busy entrepreneur, small business owner, or freelancer on-the-go! 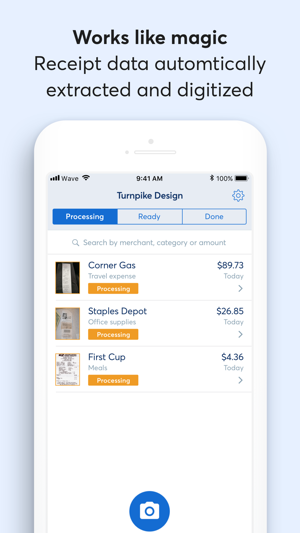 The Receipts by Wave mobile app is a key member of Wave’s family of products, and syncs magically with your online Wave account to bring expense tracking straight to your phone. 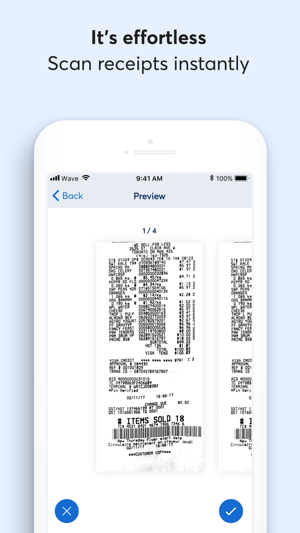 Used together, Wave’s web and mobile applications unlock Wave’s full potential to get your receipts tracked and bookkept so you’re ready to go at tax time! Come join a global community of over 3.5 million people who have used Wave for accounting, invoicing, payments, expense tracking, payroll and more. 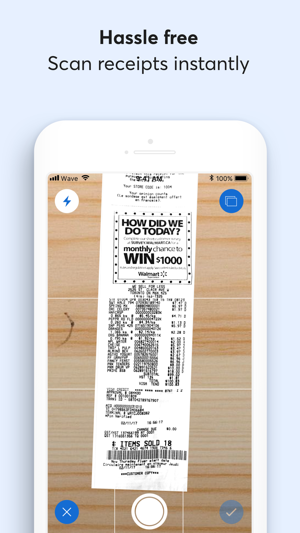 As seen in: The New York Times, Forbes, Mashable, CNBC, Inc.
• Scan receipts anytime, even offline! Wave is creating a single place for entrepreneurs to manage all their business finances. 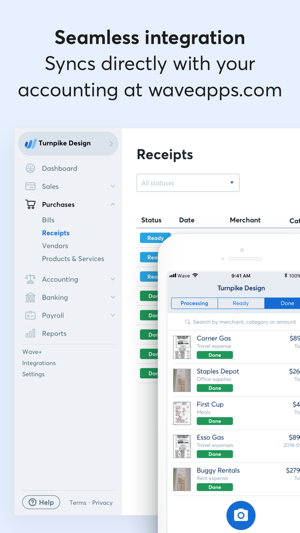 From bookkeeping and running payroll, to invoicing and collecting payments, our data driven-insights and radical focus on optimizing cash flow provide the financial sophistication entrepreneurs need to command their destinies. Log in online to get started! Loving @WaveHQ. They make accounting simple and that’s a good thing. I need my brain cells for the hard stuff. Started using @WaveHQ to take care of my account - it’s a dream! Doing my initial month of small business accounting. Whee!!!! So glad I discovered Wave. Makes this part a breeze. By using this app, you're agreeing to these terms: https://my.waveapps.com/terms/receipts. Have been using wave for a while now. Truthfully Mainly because my old accounts program became too expensive. Am I glad I looked around. 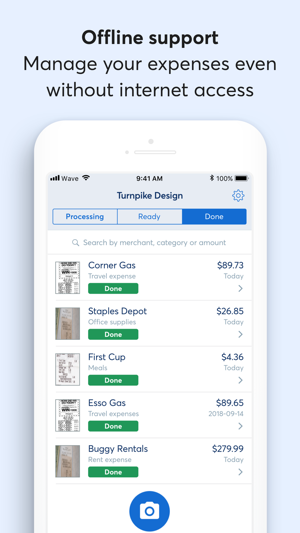 This app with the invoice app plus the web has made my job a lot easier. I create a bill then merge the receipt with it. So now I create a bill from the receipts and merge them together. Then click on the bill, hey presto the receipt is attached. This also helps with finding receipts for things. No more rummaging around in boxes or storing in a different program like before. Well done guys. I can’t wait for the estimate app to come out then all my business will be a lot easier on the move. Great app that is easy to use and super useful! Would love to see an option added to enter your mileage and track it as numbers (45p per business mile). Also the camera could use some improvements as the quality of the pictures taken through the app is not great and can be tricky to read sometimes... It would also be good if we could take multiple pictures for each receipt in case they are very long or double sided. Great app - very useful to stop paper receipts getting lost/delayed reaching the accounts dept. The only thing I can moan about is when posting them to accounting it does not always include the VAT on the transactions page even when you have added the 20% on. It shows a grey ‘VAT’ icon but says vat included: 0 so having to manually override the amounts and save once I login to wave online. One to watch out for! © 2018 Wave Financial Inc.